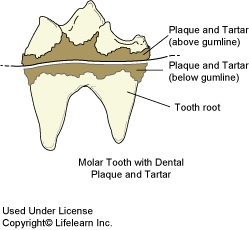 Plaque and tartar begin forming in as little as six hours after your pet’s dental cleaning. 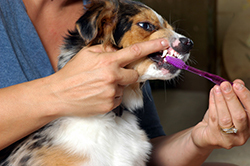 A home dental care program including regular tooth brushing is a must for all pets. Your veterinarian will provide you with detailed instructions on how to brush or rinse your pet’s teeth. Absolutely not. Human dentifrice or toothpaste should never be used in dogs. Many human toothpastes and other oral hygiene products contain xylitol, a sugar substitute that is safe for use in humans but highly toxic in dogs (for further information, see our handout “Xylitol Toxicity in Dogs”). You should also avoid using baking soda to clean your dog’s teeth. Baking soda is alkaline and if swallowed can upset the acid balance in the stomach and digestive tract. In addition, baking soda does not taste very good, and may cause your dog to be uncooperative when you try to brush its teeth. Numerous pet toothpastes that are non-foaming and safe to be swallowed are available in flavors that are appealing to dogs; depending on the brand, you may be able to find flavors such as poultry, beef, malt or mint. If you use a product that tastes good, your pet will be more likely to enjoy the whole experience. In addition to the pleasant taste, many of these doggy toothpastes contain enzymes that are designed to help break down plaque chemically, thus reducing the time you need to spend actually brushing your dog’s teeth.